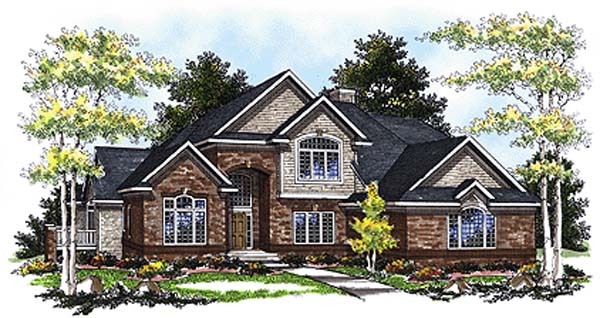 The arch top windows, and brick and stone trim enhance the front of this two-story Traditional home. The open angular stairway looks into the Great room as well as the two-story foyer. The formal dining room has three decorative columns supporting archways. To the left of the foyer is a private den for the busy professional, a half bath and the entrance to the main floor master suite. This magnificent suite has its own private deck, and a master bath with a whirlpool tub, a double vanity and a full walk-in closet. The open Great room has a centrally located fireplace with built-in cabinetry. The kitchen has a center island, a pantry, and an adjoining nook with a screened in porch leading to the wood deck for backyard gatherings. The second floor has two more bedrooms that share a full master bath.